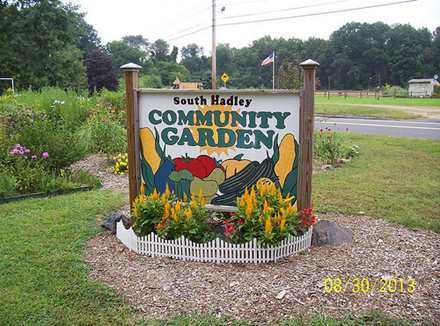 South Hadley is a town rich in resources – healthy farming soil and smart, dedicated community members. This powerful combination led to the development of land dedicated to community gardens. Not just any land, mind you. It is land that has been tilled for most of its 200 year history. It is pasture land that held dairy cows and goats and steer. It is land once worked by indigent citizens thus, still today, known as the ‘town farm’. It seems that Andy Warhol might think our ‘town farm’ is beautiful art as he once said: “… having land and not ruining it is the most beautiful art that anybody could ever want to own.” South Hadley owns, still, a beautiful piece of art in its visionary transformation of old farming land into a contemporary version of farming – our South Hadley Community Gardens. Purchased by South Hadley in 1888, this 48-acre spread, now known as Bachelor Brook Stony Brook Conservation Area, is bordered by the Connecticut River on its west side and traverses Route 47 on its eastern boundary. Sitting in the middle of this acreage is the South Hadley Community Garden – in the same location as the original Town Farm. 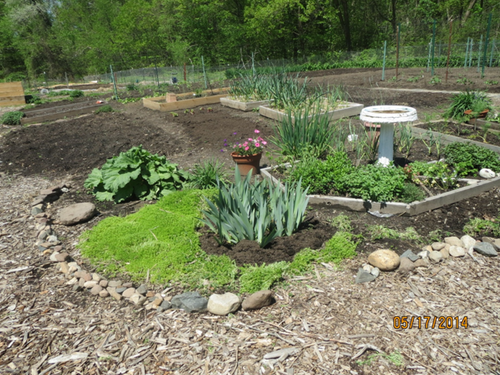 We grow many vegetables, herbs, and flowers: carrots, shallots, red onions, Romaine lettuce, parsley, lemon grass, marjoram, lemon balm, seedlings that will hopefully grow into edible Asian basil and borage, and our perennial collection of oregano, sage, chives, asparagus, and rhubarb. Please come and visit us any time. 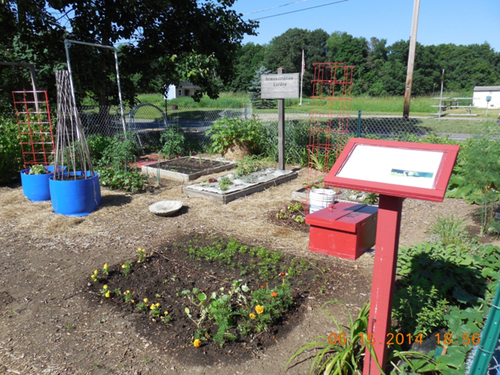 We would be happy to give you a tour of our space, the South Hadley Community Garden Site, and the South Hadley Food Pantry. We hope to see you soon this summer! In 2009, a demonstration garden was established along the perimeter of the community garden. This ‘demo garden’ is maintained by master gardeners through a grant obtained from Western Mass Master Gardeners Association. Besides demonstrating good use of soil, sun and pest control in growing herbs, vegetables and flowers, the demo garden and these master gardeners provide many models for planting, such as square-foot design, companion, container, trellis, tower and raised beds. Easy access to master gardeners is a great benefit to the community gardeners and to home gardeners as well as is evident by the constant visitors to the demo garden throughout the growing season. The combined master gardeners’ expertise and interest in developing best practices for successful gardening has been central to the resurgent interest in gardening in our community. Critically important and very fittingly, an imposing stretch of soil in the center of the 42 community garden plots is our Food Pantry Garden. Critically important because in its growth over the past five years, it has provided thousands of pounds of fresh produce to our neighbors in need. Critically important because it has provided talented gardeners – young and old – an opportunity to work together in planning, preparing, planting, maintaining and harvesting beautiful fruit from this great land. Critically important because the land itself and the volunteer workforce express our community’s values and ethics, that is, respect for our physical environment and for our citizens. 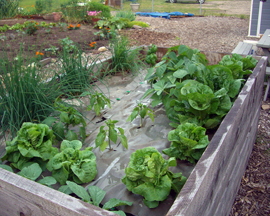 We are growing various vegetables under biodegradable mulch for soil warming and weed suppression. We found this technique to be especially effective in the handicap section of the Community Garden. It was much appreciated by our handicapped gardener. Note: the height of a handicapped garden bed is determined by the limitations of the specific gardener when the bed is constructed.